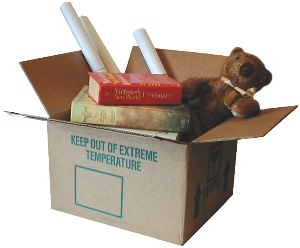 Here are some suggestions for what to bring with you when you move-in. Dorm life often means sharing space, so it is important to be thoughtful about what you decide to bring. It's a good idea to contact your roommate before you buy some items. Space is limited, so there is no need to waste it by having duplicates. Items marked with a ** below are some of things we suggest you consult on. Finally - a move-in tip: to make move-in go more smoothly, it's better to pack many small boxes that one person can easily handle rather than a few huge boxes that it takes a team to lift. Your back will thank us! Bathrobe - Students need to walk down the co-ed hallway to use the bathroom, a bathrobe can spare you (and your dormmates) from embarrassing "coverage" situations. Winter outerwear - Heavy coat, mittens, hat, scarf, boots and scarf - remember it rains a lot in winter! We encourage you to purchase a meal plan on campus, so we hope you will be eating most of your large meals in one of the dining centers. Even so, there will still be times when you want to prepare a small meal or snack in the kitchenette. The kitchenette is equipped with microwaves, inductive hotplates and various counter top appliances. Your mother doesn't live here so you'll need to clean up after yourselves. Cooking pot / pan - inductive hot plate compliant. Most of these electronic items aren't really necessary, but they sure make life fun! Whatever electronics you do bring, remember that bigger and louder ARE NOT best in dorm life. When possible try to combine items. For example, an alarm clock that is also a radio and plays MP3s or an all-in-one TV-DVR system. Remember, ** means you might want to check with your roommate(s). While the above items are suggestions, the following items are rules. Bringing these items into Sternberg Hall is a violation of the Resident Handbook and may result in administrative charges and disciplinary action. Animals / Pets - other than aquarium confined animals. Residents in need of Assistance Animals should review our Resident Handbook information BEFORE making plans to bring their animal to the dorm. Sternberg Hall is designed to provide everything essential for comfortable dorm living. Kitchenette is designed for occasional meals. If you plan to do all your cooking in the dorm you'll need to plan accordingly. Bedroom furniture includes a bed, desk, chair, and wardrobe with clothing drawers. There is a cable connection in the common room. Residents in need of Assistance Animals should review our Resident Handbook information BEFORE making plans to bring their animal to campus. A single parking space per student is provided in the Forest St. Parking Lot. Rose St Parking lot use requires a WSDOT handicap parking permit.